But.... but... this bread is delicious... and gorgeous! Most of the oatmeal breads I have tried get a lot of nutritional value from the added oatmeal, but not a lot of oatmeal flavor. In fact, the oatmeal is pretty much lost. In addition, when I've tried to top the loaf with rolled oats, they always fell off while slicing. This bread actually has the flavor of a bowl of oatmeal, and the oats coating the loaf actually stay on! For the oat flavor, the recipe incorporates prepared oatmeal, a small amount of brown sugar, and some whole wheat flour. The blend works nicely to add a reminder of a bowl of oatmeal. To make sure the rolled oats stick to the outside of the loaf, I rubbed the dough with water, and then rolled it in a sheet pan spread with the oat flakes. Why didn't I think of this before? 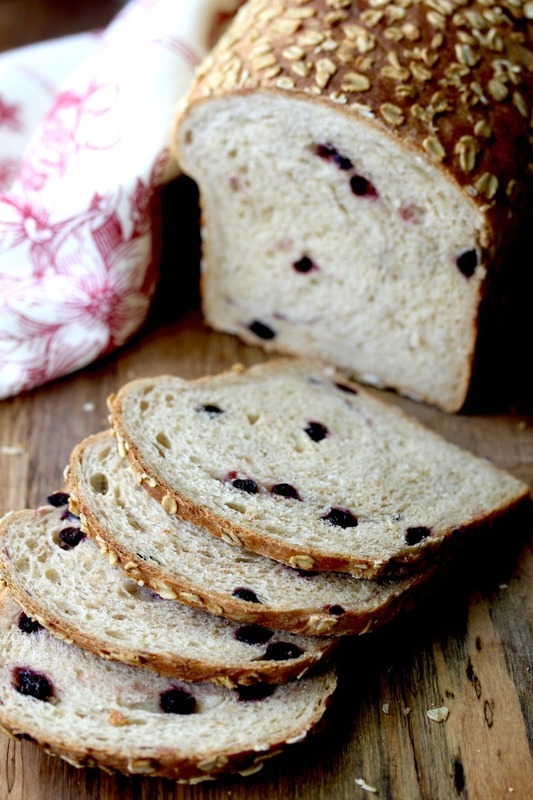 I was originally going to use raisins in this bread until I came across dried wild blueberries in the grocery store. Oh my goodness! The dried blueberries are not wrinkled and chewy like most dried fruits. Instead, they are more like fresh blueberries, but smaller and more concentrated. In the bread, they absorbed some of the liquid in the dough, and became like little pockets of blueberry jam. Just spread a slice of this bread with peanut butter and you have a PB & J. This was one of those "happy dance" breads, meaning, I cut the first slice, spread a little butter on it, took a bite, and then did a little twenty second "Carlton" dance around the kitchen. 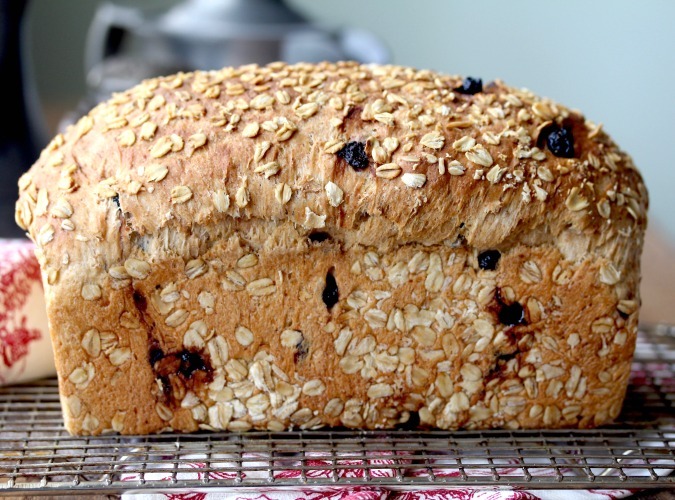 This oatmeal blueberry bread makes excellent toast, and is even wonderful for grilled cheddar, chicken salad, or sliced turkey sandwiches. In a small saucepan, bring 3/4 cup of the oats and all of the water to a simmer over medium heat. Cook until all of the water is absorbed, stirring occasionally, about two minutes. Let cool. 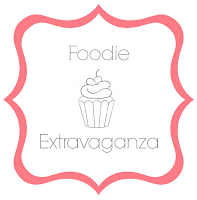 In the bowl of a stand mixer, whisk together the flours, yeast, and salt. In a 4 cup measuring cup, whisk together the milk, butter, and sugar until the sugar has dissolved. With the dough hook attached, turn the mixer on at low speed and slowly pour in the milk mixture. Mix until the dough begins to come together and all of the flour is absorbed. Scrape down the sides of the mixing bowl. Increase the speed of the mixer to medium low and knead for six minutes. You should have a smooth and elastic dough. Reduce the speed to low, and add the blueberries. Then, add the oatmeal mixture, a tablespoon at a time, until fully incorporated. This should take about three minutes. Scrape the dough out onto a lightly floured work surface, and lightly knead the dough to be sure that the blueberries are evenly distributed. The dough might be sticky, but do not add any more flour. Form the dough into a ball, and place it into an oiled bowl or dough rising bucket. Cover with plastic wrap and and let rise until doubled, about 1 1/2 to 2 hours. Place a rack in the lower third of the oven and preheat it to 350 degrees F. Oil a one-pound (4 1/2 inch by 8 1/2 inch) loaf pan. Remove the risen dough from the container and press the dough into a 6 inch square. Roll it tightly into a cylinder that should be about 8 inches long. Pinch the seam closed and gently tuck in the ends. Spread the rest of the oats out over a half sheet pan. Rub the dough "log" with water, and gently roll the loaf over the oats in the sheet pan, picking up as many oats as possible. Place the dough, seam side down, in the loaf pan. Cover loosely with oiled plastic wrap. Let the loaf rise until it crests about 1 inch above the top of the pan, about 30 to 60 minutes. Mist the loaf with water and place it in the oven to bake for about 45 to 50 minutes, until the interior reaches about 205 degrees F, rotating the loaf at about 20 minutes. De-pan the loaf and cool on a wire rack for about 3 hours. Recipe adapted from Bread Illustrated. From the editors of America's Test Kitchen. 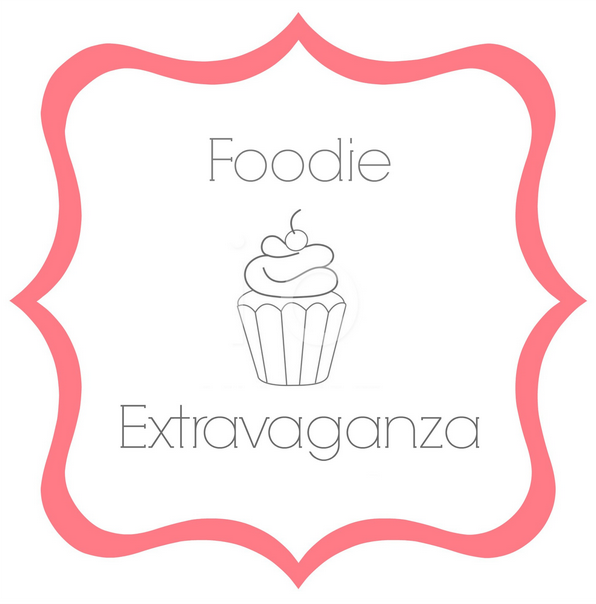 Be sure to check out the rest of the oatmeal recipes from the Foodie Extravaganza participants, hosted by A Spoonful of Thyme. Karen, your breads always amaze me...you make it look and sound so easy. Awww. Thank you! It's a fun hobby for me. You and your breads!! I always wish I could reach right into my monitor and graba a slice, Karen. Thanks for sharing. Thank Camilla! I love baking bread. 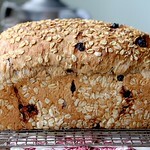 I've been meaning to make an oatmeal bread, and even more so since we had a really nice bought one recently. I love the blueberries in there too. Thanks Caroline. This would be a good one to start with! I would love this as a breakfast toast or warm with butter melting on top...I am thinking anytime bread!! Most definitely Kathy. Thank you for the great theme! Definitely putting whole wheat flour on the grocery list so I can make this bread. The whole wheat really adds a nice dimension to the flavor. Let me know how it works out! Ha ha. I won't, but I promise you'll get hooked once you have your first success! 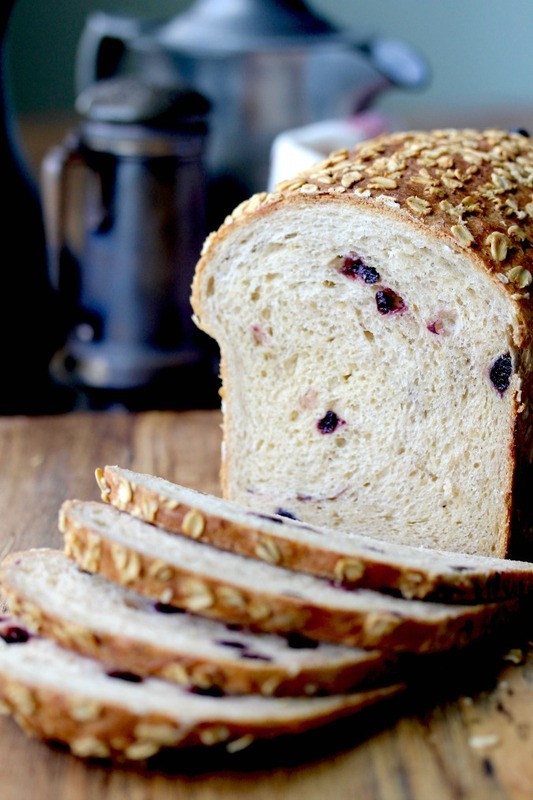 Beautiful Oatmeal bread, great combo with blueberry.